Over the past few years numbers from the Independent Evaluation Group show spending on sponsorships of sports events and other entertainment venues have surpassed $63 Billion dollars – and growing at a healthy rate of 4%. With such figures it would be a natural assumption sports organizations have an easier time getting sponsors to activate. However, this couldn’t be farther from the truth. “Sponsorship sellers typically say, ‘I have this great list of rights and benefits. Do you want to buy them?’ And then they leave the sponsor alone to activate and hope they have good metrics and renew the partnership a year later,” says one PGA Tour Executive. The tricky part is that the industry lacks a true way of measuring the value of sponsorship programs, and their in-venue activations. Not fully grasping the importance that high-profile sponsorship has in areas of customer advocacy or brand building, which results in sponsors assuming a lower Return on Investment (ROI). A study by the Association of National Advertisers (ANA) shows that 70 percent of sponsors want to validate sponsorship, but more than half do not have a reliable measurement to do so. 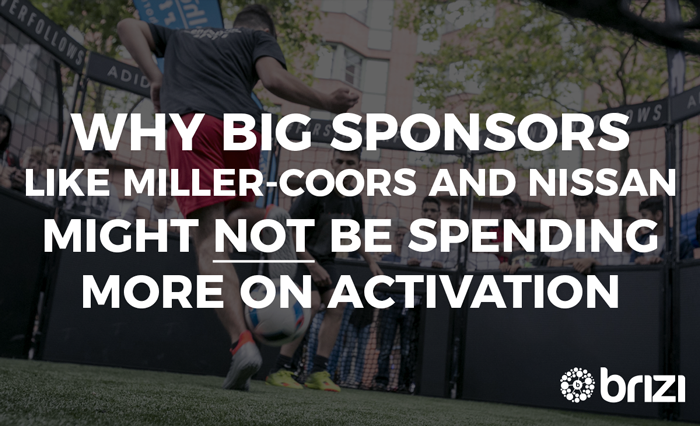 Brands sponsor sports because they have a gut feel that there is value in engaging passionate sports fans, but they don’t believe that sports properties can deliver when it comes time to activate. They can’t measure it, they don’t trust it, so they don’t value it. It’s a shame, sports properties are in the best position to engage their own fans, and they can deliver the depth of engagement sponsors so deeply want. The challenge is in scaling an activation not only within the venue, but also outside the venue, and across the sponsor’s key demographics. Traditionally this meant looking at ways to amplify small scale activation with massive paid campaigns, effectively banking on the association, and not the transformational power of the activation. Sponsors aren’t seeing the right options, they don’t believe sports properties can deliver the engagement they want with the scale they need. “I used to talk to my team about the importance of an integrated ‘360’ campaign. Now I say ‘forget 360, think 365’, having a sports contract gives you souped-up content and a way to engage with people that are passionate and are going to react to what you say with a high level of engagement,” said Pierre Diernaz, Vice-President Marketing, Nissan. The solution is also a question: How can a sports sponsorship program integrate live physical experiences across a large number of fans, and connect them to assets that reinforce key messages and engagement across all channels including digital? It’s no secret it’s up to the sports partnerships professional to create an atmosphere of shared success. “Your sponsorship opportunities should be presented as a ‘win-win’ relationship,” said Todd Uglow, who teaches event management at the University of Nevada-Las Vegas, formerly with Major League Baseball and the National Football League. Uglow believes that the strength in building partnerships, is that as objectives align, sponsors feel heard and trust is earned. At the end of the day, meeting the needs of your partners, be it through activation or otherwise, is the only way to raise sponsorship value for everyone involved.